Here’s a random review! Finally getting around to Lagaan. Which is definitely NOT Aamir’s most important film, that would be Qayamat Se Qayamat Tak or 3 Idiots or something like that. But it is the movie I feel like writing about right now, so why not? This is a Hindi movie like no other. That’s not a compliment, or an insult either, it is just a statement of fact. There are no other Hindi movies like this. If you (like many people in the world) watched Lagaan and thought “oh wow, I want to see more movies like this!” then you were going to be terribly disappointed. Most problematic were the audience members who said “oh wow, this must be what Indian film is all like!” and then stopped there. But that’s not the fault of Lagaan, not exactly. The goal of this film was to make a wonderful movie which would crossover the whole world and introduce them to Indian film. I don’t think it was supposed to be the ONLY Indian film people watched, or even the best Indian film people watched. I’ve never read the “making of” book, or seen the documentary, but I know the broad outlines of the Lagaan “story”. Ashutosh Gowariker was a former actor who had directed two films before this, Pehla Nasha with the 90s stalwart Dipak Tijori and Baazi, mostly remembered for featuring Aamir’s first fabulous drag performance. Ashutosh was not blessed with great commercial success, but he was blessed with great connections. As an actor, a decade earlier, he had roomed with Shahrukh while on a location shoot for the TV show Circus. He had been in Aamir’s first movie with him, the forgotten film Holi. Ashutosh was in the peculiar position of being able to get a meeting with the top stars in the industry, but not necessarily being able to sell them on the script he brought. Usually it goes the other way around, the script is brilliant but you can’t get the meeting. Ashutosh went to Shahrukh first, and was politely turned down, so he spun around and headed for Aamir. I can see why Shahrukh turned the film down. There is no audience for a film like Lagaan. A period village story with lots of English dialogue and white characters, almost 4 hours long. Village stories hadn’t worked in decades, period films almost never worked and when they did it was because they were huge epics, not slice of life dramas. And the kind of audience that would appreciate English dialogue and white characters wouldn’t have the patience for an old school 4 hour film. While the audience who would cheer in single-screens for 3 hours or more every week would probably not be okay with all the English and depth. The key to this film being made was Aamir realizing that no audience existed for this film, but he could create that audience. He accepted the film, founded a movie studio to produce it when no one else wanted to touch it, and brought together an all star behind the scenes team. Amitabh Bachchan as narrator, AR Rahman as composer, Bhanu Athiaya (India’s only Oscar winner at the time) as costume designer, every thing perfect. And onscreen, there was only Aamir. Surrounded by an excellent talented cast of more or less unknown actors. All of this helped to “solve” the problems of the film. Unlike other period films, it didn’t feel like modern familiar movie stars in period costumes, it felt like Aamir Khan disappearing into a character, surrounded be people who appeared to have been born fully grown in this setting, who had never existed anywhere besides this colonial era village. The perfection of the other elements helped to further ease the audience into this world, the costumes and the sets and the Amitabh narration and catchy and yet perfectly in character and in period songs, it all came together into a world that drew you in and made you forget that this wasn’t the sort of movie you were used to watching, whether that was because you were a Westerner not used to long movies with songs in the middle, or you were a desi not used to historic dramas with English dialogue. One way in which the film is different from other Indian movies is that it has surprisingly little plot in its plot. There aren’t a lot of TWIST moments, it’s more just a series of small steps all in the same direction. Aamir Khan is a village boy, Gracy Singh is the village girl with a crush on him, Kulbhushan Kharbanda is the Raja of their Village. Paul Blackthorne is the evil leader of the cantonment near the village, and Rachel Shelley is his sister. Aamir and the other villagers go to Kulbhushan to ask for relief on their tax burden because of the drought, and Paul Blackthorne needles Aamir into instead agreeing to playing a Cricket match for tax relief, or else they will pay double taxes if they lose. Aamir inspires the other villages to join his Cricket team, Rachel Shelley offers to coach and teach the game, Gracy Singh gets jealous of Aamir’s closeness with Rachel and Rachel begins to fall in love with him. In the end, they win the Cricket match, Aamir picks Gracy, and Rachel and Paul go back to England forever. Here’s something that I don’t think I’ve heard talked about before with this movie, and was one of the things that stood out for me when I first watched it long long long ago: the love triangle is very unusual, because half the characters never realize they are in it. Gracy Singh is jealous and (correctly) afraid that Rachel Shelley is in love with Aamir. Rachel Shelley is falling in love with Aamir and dreamily assumes he will feel the same way about her, and totally blind to Gracy’s existance. And meanwhile Aamir, after being teasing and difficult for most of the film, finally reveals that he has been in love with Gracy all along and didn’t even think of Rachel. The only other love triangle I can think of like this is from another Aamir movie, Rangeela. In that one, Aamir was the one tortured by jealousy, Jackie Shroff was unaware that he had a rival, and Urmila was the one who was always obviously (to her) in love with one man to the point that it never occurred to her the other man might have learned to care about her as well. And the other similarity with Lagaan is that both films used the love triangle to explore class and power, the leg of the triangle with the most power is blind to the reality of the lower class other legs. In this, Rachel Shelley fantasizes about the pure Indian villager, watches him dance as Krishna and is excited by his handsomeness and perfection, and doesn’t even see the woman dancing with him as Radha, the perfect couple right in front of her. She is blind both to Aamir’s disinterested politeness to her, and Gracy Singh’s very existence. She just forces the world into being what she expects it to be. Meanwhile, Aamir does not even consider Rachel not because he doesn’t think he is “good enough” for her, or because he thinks he is too good for her, but simply because he had already made his decision long before he even met Rachel, he was control of his own life and never thought that his life could be effected by someone else. Nor should it have been! He was in love with the girl next door, and working on a slow long term plan to make their romance unfold, it doesn’t matter if some other woman fell in love with him, he still had the right to create the romance he wanted, the romance that would be happiest for himself and the woman he loved. I wish the 4th leg of the triangle (so, the pyramid) had gotten a slightly larger role, because that’s where the statement gets really interesting. The woodcutter who is in love with Gracy agrees to be a double agent for the British after having his heart broken seeing her feelings for Aamir. But, eventually, he realizes the error of his ways and returns to the team to play for them honestly. While Rachel was going to Aamir and Gracy from a higher level, assuming she would get everything she wanted and blind to their own agency, Yashpal Sharma is coming from below, aware of Gracy’s feelings for Aamir and not exactly surprised when she picks him. But that doesn’t mean there isn’t a danger, his bitterness and sense of injustice and powerlessness turns toxic. Until it is cured by realizing that Gracy and Aamir falling in love is nothing to do with him, and that there is a higher structure of power he needs to overthrow. At least, I think that’s what his story is. It’s a little abbreviated because we need the NEVER ENDING CRICKET MATCH instead of more character scenes. Really, besides Aamir and Gracy and Rachel, there are surprisingly little character moments. At least, deep moments. Instead, each character on the team gets a simple identification and character moment and then continues in the background for the rest of the film. The Sikh ex-military, the untouchable, and so on and so on. Really, it is just the strangest film! Almost no plot, way too many characters with way too little backstories, a Cricket match that is played essentially run by run. On top of the village setting, the historical time period, all the other odd things. But somehow it works, the setting feels right, the characters we care about manage to carry all the others we don’t really know, the songs and the beauty of the visuals lose you in the story and you forget that it makes no sense. It’s not surprising that there is no other film quite like this one. I don’t think there could be, not with this mixture of Indian village stories and crossover Anglo-Indian drama, and Cricket. But there is this one remarkable and remarkably odd film. 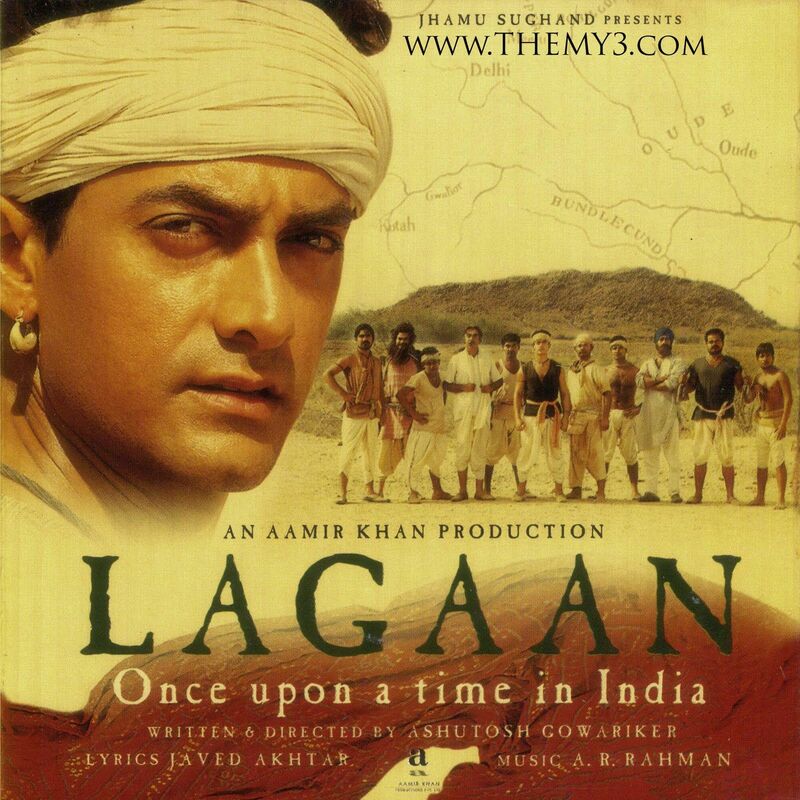 This entry was posted in Uncategorized and tagged Aamir Khan, AR Rahman, Lagaan, Review by mredlich21. Bookmark the permalink. Lagaan was one of the first Indian movies I saw that had western actors, and I thought, why did they use these terrible performers? Then after seeing other Indian movies with even more terrible western actors, I decided the ones in Lagaan were pretty good by comparison. And Paul Blackthorne at least has gone on to a surprisingly good career! He pops up all over the place. i loved the songs more than the movie.The story for me was ok.Loved O rey chori.What i did like is Aamir’s willingness to act in a different script rather than choosing the most safest script. Yes, and not just act in it, but produce it. I could see a different star taking the role but trying to shorten the length of the film and make the love story more prominent and so on. Aamir was so committed to this unique vision that he became producer as well to make sure there was no interference. A personal random what if question. I should probably save it for Monday, but Im going to ask anyway. You said Lagaan was your first movie. But it was DDLJ which was your third(?) that got you hooked to SRK and Indian cinema. Let us say SRK had accepted the part when it was first offered to him. How different do you think it would have been for you personally, since you watched it first? Considering that Aamir had particularly marketed Lagaan for overseas audience, would Lagaan have joined K3G and Devdas in reaching international audience if it were SRK? How different the movie itself would have been? Very interesting question! I don’t think Lagaan would have broken through to the international audience at all if it were Shahrukh in the role. I don’t think he is as good at marketing as Aamir. I think it would have been yet another Shahrukh film that did well overseas but didn’t reach to the film snobs and film buffs in small towns. I also don’t think it would have broken through even as much as K3G and Devdas did. Devdas sold a very melodramatic over the top version of Indian cinema, that worked well in the West, along with using major stars and a familiar story which worked well at home. Plus a great soundtrack. K3G was the sort of family melodrama that stroke a chord in the European audience, you can see that through today, it is the Karan Johar films that consistantly do much better in Europe. But Lagaan, without Aamir producing it and committed to the director’s vision, would have been a bit of an odd fit, I see it turning into Asoka more than anything, a bit of an oddity in the SRK filmography but not a really interesting film on its own. SRK would have made it too star studded and too modern feeling to work. I do think I would have still seen DDLJ eventually, because I was watching every movie playing in art theaters every weekend, so I would have run across it. I’m not sure if it would have hit me in the same way though, I might have gotten confused between loving that particular film and loving Indian cinema as a whole. As it was, I was able to be clear about Indian film versus Shahrukh Khan versus DDLJ and the place each category had in my life. I kept thinking it would have performed something like Swades. A critics favourite, but so-so commercially. But then Swades wouldn’t have worked without SRK going by Ashutosh’s vision, which he wouldn’t have without Lagaan, and Lagaan wouldn’t have been Lagaan if Aamir had not trusted Ashutosh. I have a headache now. SRK’s choices are interesting, in terms of what he did as well as what he rejected. Like this and Munnabhai. Whether they would have worked or not is a different question, but I think massive succeses of these unconventional films are what got him to believe in projects like Swades, Chak De India (and Fan may be) with varying results. Irrespective of the results, I as a moviegoer am glad those movies exist. Yep, I had that same head hurt! “But, Shahrukh made Swades! Which was clearly faithful to the director’s vision. But then, he wouldn’t have trusted the director without Lagaan”. And the same with Munna Bhai, if he had taken it, he wouldn’t have let Raju di what he wanted to do and it would have been a different movie. And you have the flip of the Farah trilogy. He learned to trust Farah after Main Hoon Na and followed her insane vision for OSO to massive success, but then failed when following her in Happy New Year. The same with Rohit Shetty and Chennai Express versus Dilwale. (I’m far from the first person to have this epiphany) SRK is in a very tricky position now. Aamir has this credibility with his unconventional projects that even his imperfect films end up smashing box office records. Salman’s movies have to be the worst of the worst like Tubelight for them to not work. Akshay does so many movies every year, one hit is enought to compensate for his experimental or sub-standard fares. For SRK however, that massive success seems to evade him. No bet is “safe” any more. No experiment seems to work. What do you think is the right course for him? If my boss gives me Memorial Day off (is that the one that’s coming up? Or is that Labor Day? ), maybe then! It’s a lot easier to schedule during the day, and I never seem to have enough time on regular weekends. My sister just watched Balu Mahi, the Pakistani movie on Netflix, and said it was incredibly fun, so I kind of want to do that next. And I also really want to force you to watch more Aamir movies 🙂 If you want a simple response to the “Shahrukh is responsible for all sexual harassment on film in the history of the world” kind of articles, check out Dil. Aamir goes WAY WAY over the line in that movie! And it is also very fun in that 90s romance kind of way. Haha! Of all things, Dil Se was on the plane on my last trip, to Rwanda via Amsterdam. I watched it both directions. I could see people around me giving such weird looks once in a while. It is a strange film to catch glimpses of, without sound or context, lol. Will keep Dil in mind. I kind of want to watch the one you posted about with Aamir, Juhi, Kajol, and Ajay. Looks fun. Ishq? Super fun! And also, another one where Aamir goes way way way way way over the line in a very 90s rom-com way. But Ishq is sort of so bad that there is no way to enjoy it without making fun of it. Whereas Dil has some sincerity to it, there are lovely little moments between Madhuri and Aamir. And possibly the best wedding scene EVER in Hindi film. This is why I’m an Aamir fan even with all of his flaws and problems with his work and how he can be precious and annoying. Taking on this kind of risk when his career wasn’t going well, completely committing himself to realizing the vision for the film. Also, his performance is a star turn but he’s generous with the other actors, they have room to breathe and shine as well. The biggest problem I have with the film is that Bhuvan is too perfect. He never has self-doubts or moments of weakness. It’s the same problem I have with Rancho in 3 Idiots but it’s not as glaring in that film since you have two other co-leads who get equal screen time. Yeah, I think that’s a problem in general with latter day Aamir films. And I don’t think it is necessarily because he wants his characters to be perfect or anything like that, I feel like there is an idea that the concept of the films are so out there, we need the strong voice of reason and perfection to get us through them. But it’s also why Talaash and Rang De are my favorites over 3 Idiots and Lagaan and Dangal and so on when I look at Aamir performances. He let’s himself be human and flawed in those films, instead of the perfect center. Yep! As you know those are my faves too. He has the acting chops to pull off much more complex parts. I get the reasoning but it’s frustrating as a fan. Jo Jeeta Wohi Sikander, if you are ever able to watch it, is a wonderful performance in which he manages to be foolish and immature for the majority of the film but still have you like the character. Ghulam too. I have it now! Will try to watch it this weekend. When I saw this movie, the first thing I thought was “This is like The Milagro Beanfield War”, a musical-fable-dramedy movie from the late 80s made by Robert Redford about a Mexican or New Mexican village against The White Man or The Establishment. Both movies harken back to the Village movies of the black and white era of Hindi cinema. Milagro did a better job of getting us to know a wide variety if characters in the community, both the Mexicans and the Whites. I just wonder if A Gowarikar saw Milagro and thought “hey they made an Indian film, we can do this better…”. I prefer Milagro, but both are worth seeing. Lagaan’s bigger significance to me is in how it signifies a shift in Aamir’s career. There is Aamir pre Lagaan and Aamir post Lagaan. Almost like this movie gave him direction and motivation in how he would move forward. Maybe it’s why Aamir never suffered the midlife crisis that Salman had in most of the 2000s or that SRK is going through now. No one remembers Mela!!!! I feel like Aamir had that massive embarrassing flop, and switched gears effectively and so fast that no one remembers the flop happened. And then again with Mangal Panday followed by Rang De. Which isn’t to take away from your point, he did a career correction in response to a changing market place. But it wasn’t a preventative correction, he had a failure before and then changed in response to it. But he changed much faster, and better, than Salman or Shahrukh managed to, he accepted the lesson of the flop and thought outside of the box in terms of how to shift his career, while Salman and Shahrukh resisted/resist acknowledging the problem, or else flail around making bad choices in how to address it. Of course everyone has a bad movie now and then. But what it seems to me is that pre Lagaan, he was an actor or even a star in films, and with Lagaan and all films since, he makes movies that he thinks should be made, that he had a conviction for. And secondarily, he acts in them, sometimes as the lead, sometimes supporting, but the point is that he’s backing a movie that he whole heartedly thinks should exist. The closest I can think of on the Hollywood side is George Clooney. Post ER & Batman, he only makes movies that he feels a strong conviction for. Yep, I agree. I think part of that might also be that he has chosen to place art over relationships. I don’t think Salman and Shahrukh and other actors are out there saying “I want to make a bad movie”, or “I am making a movie just for the money”, but I think more often they are making choices based on relationships rather than clear headed artistic and business sense. The opposite of “I only make movies that I think need to exist” isn’t “I want to make bad films”. That’s really reducing my point. Actually I mean something more specific. Though I don’t know any of them personally, so this is purely speculation, combined with what I’ve seen or heard from interviews – that both Salman and SRK are motivated by a variety of factors. I think SRK is most motivated by what he wants to do as an actor at the given moment. One moment maybe he wants to have a megahit with rohit shetty. Or at another moment maybe he wants to branch out and deconstruct his image. I think for him it’s about the role and how it challenges and stretches and satisfies him as an actor. I’m not saying he’s going to purposely make a bad movie just because a role is good, but he wants a successful movie in which he can do something he finds interesting. Salman is very much about servicing his fans, while secondarily about remaining relevant. He went through almost a decade of lean years, so I’m sure that experience has informed all his choices since. IMO for him it’s about sustaining his career and keeping people watching his movies, and tangentially, keeping Bollywood entertainment alive as a viable industry. I’m sorry, I didn’t mean to reduce your point, just pull out how clearly you phrased it, often I hear lazy people (not you) minimize it to “Aamir makes only good movies, therefore everyone else doesn’t care about making good movies”. Which isn’t exactly right, it’s more that Aamir cares about making good movies more than any other consideration.